Exclusive Autographed CD available through our online shop! EAST BAY SOUL 2.0 Much of the early buzz surrounding the release of East Bay Soul 2.0 has been about how a sensational campaign to raise the $25,000 necessary to record the album hit its target. However, now it s all about the music. Make no mistake, this is a collection of the highest order and everything (plus a little bit more) that one would expect from the creative genius of its creator Greg Adams. Of course Adams was the founding member of Tower of Power where his signature sound as performer and arranger made the TOP horn section a sought out entity all it’s own. Now, factor in Darryl Walker’s powerful soul drenched vocals, add eight other world class artists and the result is a singular vision of instrumental funk, jazz and soul music brought to audiences in a fresh new way. This is new a movement in Urban Jazz; this is East Bay Soul 2.0 . If anyone is in any doubt as to the credentials of this highly anticipated release they need look no further than the big, brassy and in your face The Getaway which provides a wonderful platform for Adams on muted trumpet. Totally in the finest traditions of what he does best it is mirrored by Back to Oakland , which serves as a superb showcase for the entire band. This tremendous coming together of the horn and rhythm sections also includes a taster of Darryl Walker s vocals, yet Walker is found at his soulful best for the albums only cover, Adams silky re-imaging of the Marvin Gaye classic What s Going On . When Walker returns for the emotionally supercharged I m Coming Home he helps to provide one of the CD s more tender moments yet truth to tell Adams creates adequate time and space for some outstandingly soul tinged ballads. In this respect there is none better than the magnificent Once and For All while elsewhere The Love Of My Life proves to be another big, soulful ballad with Walker very much center stage. He sticks around for the high octane and totally enthralling The Devil You Know but when the emphasis switches back to instrumentals, the joyous Carry On finds Adams in fabulous form. It s the sort of track to put a huge smile on your face and, with a smattering of Hammond-B3 from Joey Navarro, is completely on the money. The aptly named Brassalicious just about explains all you need to know about this lusciously funky tune and the first single to be serviced to radio is To Catch A Thief which features Adams on Flugelhorn. The title To Catch A Thief was inspired by the 1954 Alfred Hitchcock movie of the same name. In writing the song it conjured up for Adams the role of John Robie, a reformed jewel thief known as The Cat who, in the film, was played by the great Cary Grant. With a languid yet easy grooving vibe this ultra cool cut benefits from more killer Hammond B3 Navarro and is certain to do well. Greg Adams has been a driving force to define artistry that transcends musical genres, still seeking out a course not yet traveled, is at his best when set to explore anew artistic destination. 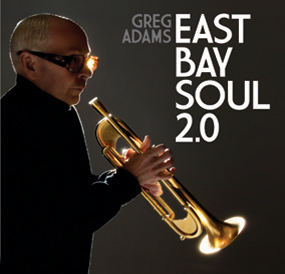 The journey continues with East Bay Soul 2.0 – The 2012 release from trumpeter, songwriter Greg Adams, produces a collection of 10 dynamic songs backed by East Bay Soul. Adams signature sound is clearly stamped through out the album’s 10 tracks, an equal mix of instrumental and vocal songs – a blend of Funk Jazz, R&B and Soul. With a nod to the music Adams loves, and inked in his own style creates music that is relevant and fresh. Greg takes you on an incredible ride that is groove driven, weaving his horn melodies with soul drenched vocals into a collection of songs that are all at once dynamic and dreamy, cinematic and oh so to fall in love with. This very special recording boasts the full strength of the rhythm and horn sections, performing in layers of percussive up-tempo instrumentals to lush romantic ballads sung by Darryl Walker.Walker possesses a true classic voice- an effortless delivery with complete commitment to the emotion of the song. Adding the superb combination of sax men Michael Paulo on alto and tenor sax and Johnnie Bamont on alto, tenor, baritone saxophones and flute, Sean Billings on trumpet, Lee Thornburg on Trombone, Joey Navarro on keyboards, Dwayne “Smitty” Smith on bass, James Wirrick on guitar, Herman Matthews on drums and Johnny Sandoval on percussion. This equation goes world class. The classic groove anthem “What’s Goin’ On”, immortalized by Marvin Gaye, is the disc’s only cover song. Darryl’s vocals are pure liquid gold and the track just breathes wide open with a pastel groove all its own. “Once And For All” the classically lush ballad delivered with passion by Walker with its vast string section is the palette that paints the richness of the song.